This Sunday, April 23rd, starting at 10:15a.m. (Pacific) , I’ll be conducting a free “Tax Resistance 101” webinar. I am resisting the $128,005 I owe in federal income tax for 2016 because nearly 50% of anything I do pay will go for war or preparation for war. I cannot in good conscience pay for war. I have donated more than that amount to meet human needs internationally and nationally and locally. Olympia-area man says he won’t pay tax bill until he sees Trump’s tax return. Phil Miller is the latest example of a new phenomenon — tax resisters motivated by a specific anti-Trump agenda, rather than a more administration-agnostic policy like militarism. Here’s another in that genre: Americans Should Refuse to Pay Federal Income Tax if Trump Does Not Release Tax Returns (If the president doesn't pay taxes, why should American citizens?) says Ben Cohen of The Daily Banter . 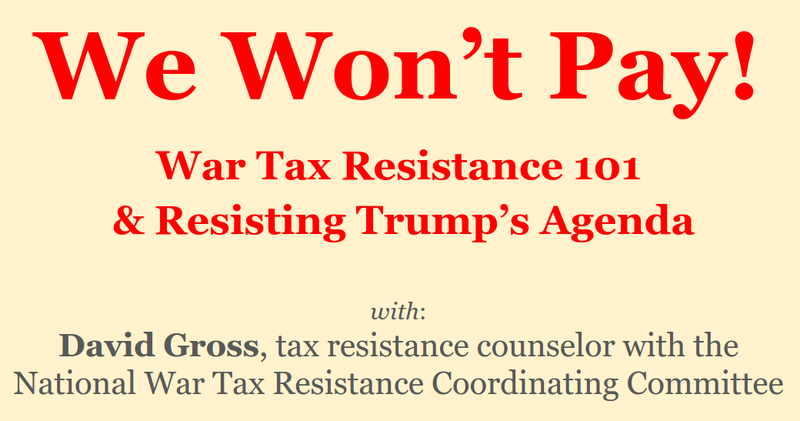 No War, No Trump: Tax Resisters Withhold Support reports Josh Brokaw at TruthSayers . Tax Day Protests Highlight Refusal to Pay for War reports Popular Resistance . Here are some photos from a tax day war tax resistance demonstration at the IRS building in New York City, and here’s a brief video clip. Lindsay Koshgarian, at truthout , writes about Where Your Dollars Are Going: Why Some Antiwar Activists Are Withholding Taxes (but spends most of the article defending government spending and the taxes that fund it). Here are some photos and video from a tax day protest put on by Citizens for Peace in Space. 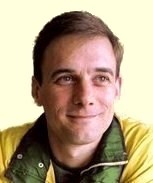 “This Man Can Help You Escape the IRS Forever” breathlessly writes Mother Jones . The article is about a legal adviser who helps wealthy people get themselves and their assets expatriated to low-tax areas. NWTRCC recaps this year’s tax season at its blog.